My husband told me these tasted fabulous. I was slightly taken aback because I can't remember if my husband has ever said something I've cooked was fabulous! Bake for approx. 20 minutes, or until lightly golden. Cool on a wire rack. 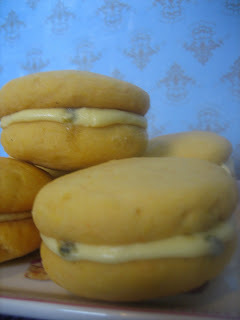 To make the filling, beat the butter and sugar until light and creamy, then beat in the passionfruit pulp. Use the filling to sandwich the biscuits together. Leave to firm before serving. Makes 14 filled biscuits. I found your blog through Bobbie's ... oh my, I've just spent the last little while drooling over the yummy stuff you have on here. I love to bake too. My problem is I then eat what I've baked, which isn't good! I'll be coming back here for inspiration next time I'm cooking!